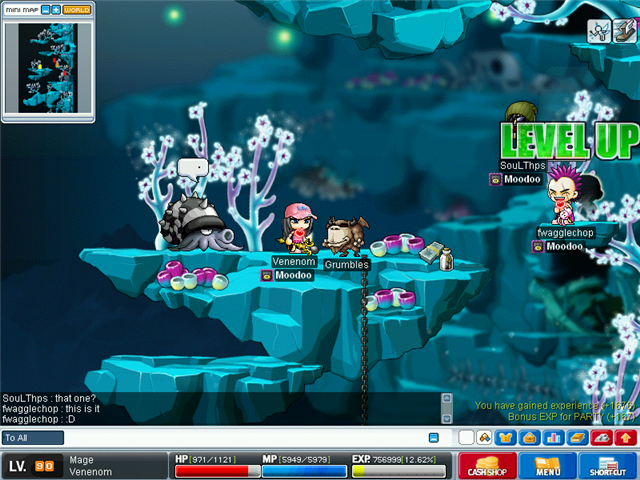 Maplestory isn't such a bad game. Those who argue the different flaws in the game are trying to put forward nonexistent points. I'm not saying that there aren't flaws, just that some mentioned flaws don't exist. Combat: People say that you just hold down the attack key and it's boring. If you hold down the attack key, chances are that you will lose hp. You have to press that attack key at a regular rate to repel the monster. And anyway, who can think of a better method than a combat method that uses skill to determine output? You have to regulate your hp, skills, and attacks all at the same time. For a lot of people, it's a fun mental exercise. Anyway, what about all the other games? Look at Runescape. Click on a monster and watch your character hack away at it with a sword. Or Warcraft. Click on a unit, tell it to attack a character, and watch your unit attack the character. What about browser-based games like Kingdom of Loathing? Click on Attack and see "You hit the opponent for X damage. Graphics: Excellent in my opinion. Who cares if the graphics aren't 3D? Makes the game a lot simpler and also makes updates faster as well. Who wants to spend hours on one 3d character? Certainly not me or Wizet/Nexon. Anyway, the chibi characters are actually quite interesting. Not everyone wants to play war games where you shoot people and you can see the blood spurting out of their head. What about the female section of the human race? Realistic graphics are not always the best choice. Anyway the cartoon characters look better. Character Design: The characters, I admit, are quite simplistic and monotonous, but they aren't really that bad. You can choose from about 20 different hairstyles and colours and there are many different clothes and things you can wear as well. Just because you started with a sword doesn't mean you have to stay with it for the rest of your life. Monsters: The Monsters are designed quite effectively, and I have no problems with them. The attack animations, especially for the bosses are to be commended. The variety in the different monsters if also quite good. Who would have thought you would be fighting trees, giant fish, snails, blobs of slime, boars, dragons, and an Aztec god? Quests: The quests are better than average, but not excellent. There is quite a lot of variety, and I think the best quests are the jumping ones. Unlike quests in other game where you click things for months on end, you are tested on your real-life dexterity, reflexes, and patience. Sound: The music is excellent for a computer game. The sound effects for hitting monsters are also quite good. There are countless varieties of soundtracks, one for each place, so the place develops its own significance. And you don't have to select the music from a list, and find which ones you want to listen to. You can just press the up button and there will be a new sound track. 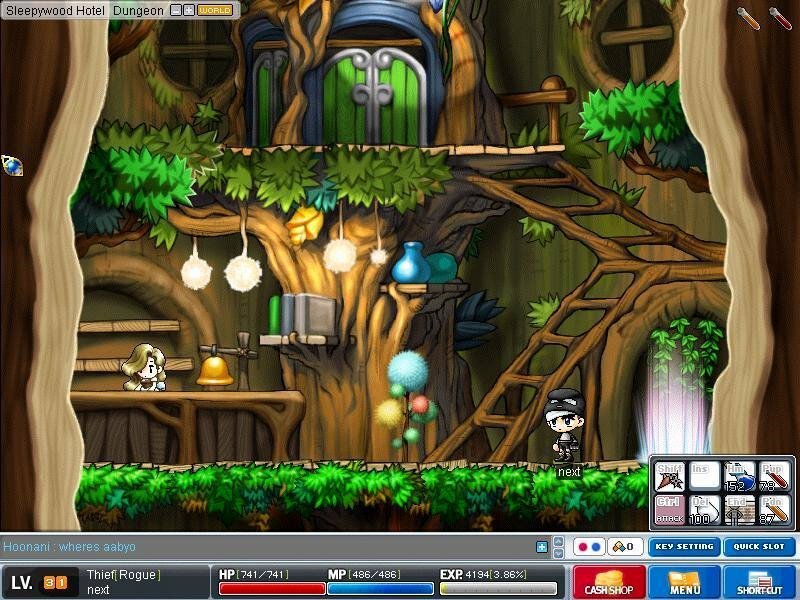 Money: One of the important things about MapleStory is that it's generally free. Those who buy things from the Cash Shop hardly get any gameplay advantages over those that don't. People who want better looking clothes are welcome to do that if they want, and I hardly condemn them for helping Maplestory support its servers. 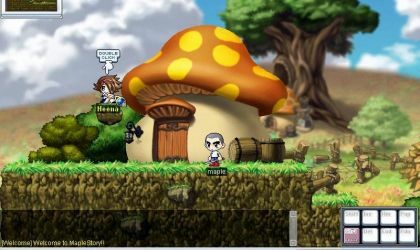 Job Advancement: The Job advancement promotes choice in Maplestory. It makes your character look unique, and gives each character their unique set of skills. 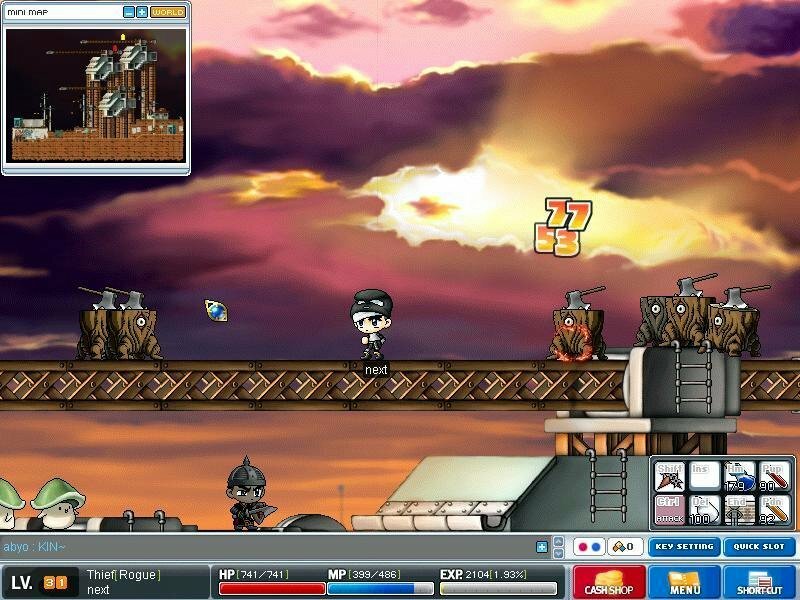 This is one of the major parts of MapleStory that makes it stand out above the rest of the MMORPG's. There are many skills, all of which you can put skill points on to make more powerful. PvP: Many people comment on MapleStory's lack of PvP. Why do you think Maplestory doesn't have PvP? Isn't is obvious? You cannot transfer a data signal at insane speeds down halfway across the world into a server, back halfway across the world and expect fair PvP. Imagine seeing a character on 5 hp, you attacking him, and then realising that the character healed all his hp about 20 seconds ago. 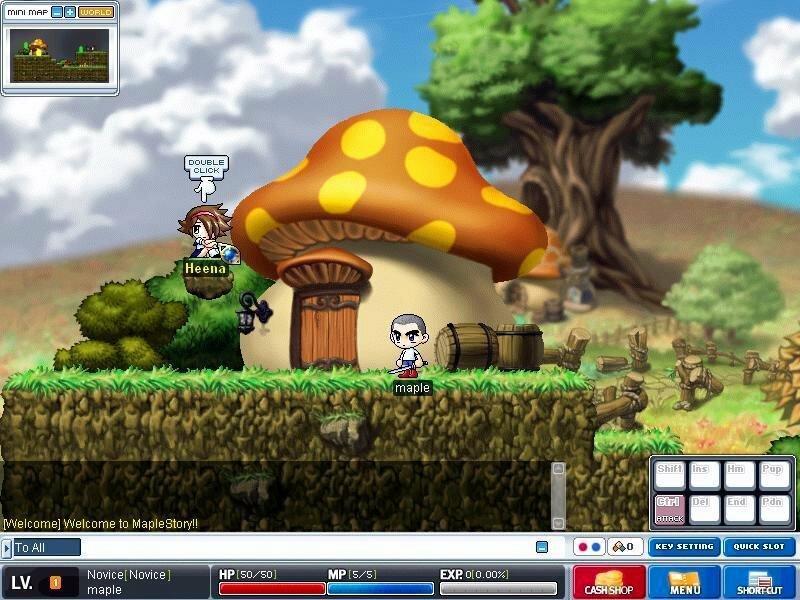 Anyhow, Maplestory does actually have PvP. Monster Carnival is a PvP party quest thing. You see who can get the most kills, and it gives one of the highest experience rates at the level too. I admit that the names of the jobs sound stupid if you really think about them, but you get used to it after a while. 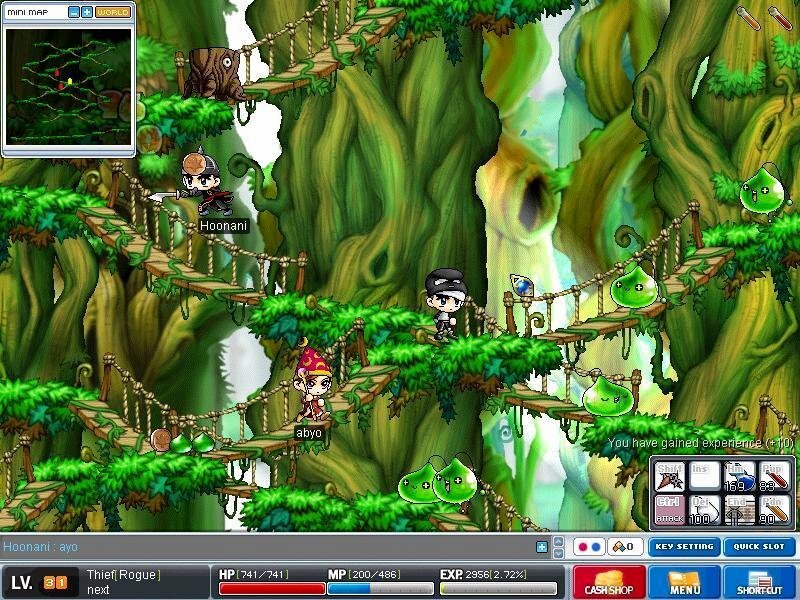 When I first downloaded MapleStory I thought, "Hey, a neat 2d MMORPG. This could be pretty cool." 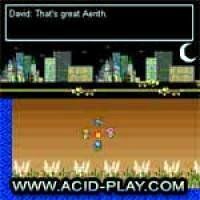 But as I started playing it, I began to realize the monotony of the game. Leveling: Leveling up takes an insane amount of time. I have been playing this game for almost a year and the highest level I have gotten was 28. The most experience I got from a monster was around 120, but that was on a double-experience day. Now, take into account that some levels take up over 100,000 exp to level. It would take you killing 800+ [120 exp] monsters that don't spawn very often and are some times challenging, on a 2x exp day for you to level ONCE. Combat: Combat is extremely boring and repetitive. Depending on your character type, you will use at most 5 attacks throughout the entire game. Most combat goes like this: Attack, attack, attack, attack, attack, run away, heal, repeat. This as you can imagine gets incredibly boring, making the leveling process even more tiresome. Character/Enemy Creation: This part of the game was a huge letdown. When you start a character, you can choose from about 5 faces, 3 hair styles, and maybe 3 colors for hair. There are just as few clothing options. You can access more clothes/faces/etc by purchasing items from the "Cash Shop," but otherwise you'll run around looking like everyone else. Enemies, on the other hand, can vary quite a bit. They go from Snails to giant floating pieces of armor, such as Gate Guardians. For the most part, the enemies are well designed and fit the style of game really well. Equpiment Variety: Once your character starts gaining levels, there are actually quite a few options for weapons and armor. Each piece of equipment has its own stat requirements, which sometimes can be a pain. At lower levels, most of the armor looks rather dull and provides little protection. But once your character is good enough, some of the armor actually makes a difference. Quests: Albeit there are plenty to be found, most of the quests are quite worthless and time consuming. A majority of the quests can be summed up like this: Talk to NPC, fight monsters, collect drop items, talk to NPC. Those are "Collect Quests." There are also "Jump Quests," in which you - yes, that's right - jump. Then there are "Trade Quests," which go like this: Talk to Person A, get item, give to Person B. Those are the three quest types. Story (0/10): If there is a story, I haven't found it yet. You start on Maple Island, get some beginner quests, then transfer to Victoria Island. All there is really is quests. I know that there is a final boss, Zuma, that you can kill; however, since he respawns, it's not all too major of a "plot point." Graphics (8/10): The graphics for this game are rather good. Simple, 2d, chibi anime graphics for the characters; nicely done backgrounds. The user-interface is easy to use and is well designed. However, once you get into spells/skills, the graphic quality goes down. Most spells are just sparks or slashes, not too extravagant. The enemies are well designed and fit the style of game. Gameplay (2/10): Terrible. If there's anything you should've caught from the above statements, this is it. 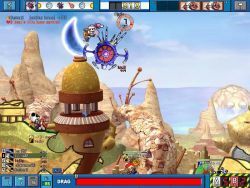 Gameplay consists of constantly hitting the attack button, occasionally using a spell or potion, and leveling. There is no PvP, which takes out a lot of interest as well. The controls, however, are easy to configure. That's one of the only reasons this category got a 2. Another reason is the "Cash Shop," which allows you to use actual money to purchase additional clothing, hair, and other miscellaneous items. But if you don't want to spend your hard earned cash, it doesn't effect gameplay at all. Sound (5/10): The music is quite repetitive. Several times I found myself popping in a CD and listening to that. It's well made, but it loops way too frequently. The sounds for getting hit, hitting, casting spells, etc. are of decent quality, but aren't anything special. Replay Value (1/10): Unless you find yourself enjoying constantly fighting, collecting items, jumping and leveling slowly, there is no replay value. Combat is incredibly boring. It basically boils down to standing infront of your enemy, and holding the attack key. It also takes incredibly long to level up, as the rate for leveling increases about 1000 points or so each level. Once you level, (depending if you have your job or not) You only get 4 (or 3, my memory is bad) skill points to set towards special skills, 5 for normal stats. Leveling gets incredibly hard once past level 8. Healing is also a pain in latter levels, as you have to stand perfectly still, not moving anything. You gain 10+hp about every 15 seconds, so with higher levels come heftyer HP, and longer wait. Keep a Gameboy, PSP, book, whatever handy as you're healing. Lagging is also a major issue, even for people on broadband (I have DSL). People like to huddle in one big area to sell things, even though some towns have areas set aside for it, which really lags everything in their general area down. Imagine "SELLING BLANK, BLANK, BLANK, BLANK AND BLANK FOR 29K" 3 times every second, and you'll get the general idea. I can imagine what hell this must be on a dial up connection. Lagging during fighting is also potentially fatal, as one hit from a lag can knock you into more, and sometimes more powerful, enemies before you even know what's wailing on you. A lot of the quests dont really kick in until level 15, if you have beared the game this far. Most of them however, require you to get items that take a level 20 character to get. So your only options are to level up until you are strong enough to kill the monsters for them item, buy the items, or leech off other people. They also ask for items in big numbers. 50 Green Musroom caps, and 50 Bubbling bubbles is seemingly impossible for level 15 players, not to mention impossible because you have to be a higher level to access the subway to get the Bubble-whatevers. Once you have your job, you kinda wonder around Victoria going "Now what?". That's pretty much all there is to do in this game, talk up sales, hold the ATK button, and wonder around completing quests. It just doesnt have much depth to it. The people here are NO HELP in the experience either. Sure, you will find some cool people, and helpful people, but everyone else is either KS'ing (Kill stealing, against the game rules), lagging up your game with thier incompetant sales techniques, or just a random face. KS'ing is a major problem as well. When two people attack the same monster, the EXP is split up amongst the two depending on how much damage is dealt. When random people come over and begin hacking away on something you're already in the process of killing, it makes it even harder to level. Funny thing is, KS'ing is a direct violation of the game rules, yet everyone seems to get away with it. On a side note, DON'T DROP ITEMS IN THE OPEN!! Dont drop an item on the ground for ANY reason. People WILL run by and steal your item. Always use the Trade window for exchanging items, even when simply giving an item or gift, use the trade window. I've lost many an items because of theives. All the (many) negative points aside, it is a very creative game. 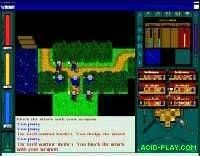 I had no idea how a 2-D MMORPG would work, but they pulled it off. The interface is fairly easy to use, and all the commands can be set to any key you want. Layout of the land is very well done, and the characters, NPCs, and backgrounds are rendered very well for a 2-D game. This game would have been so fun if it wasn't so flawed. Try again, Wizet. Well, i've read a bunch of reviews on this game, and have decided to write my own. Having been a veteran player of this game, over 4 yrs worth, a lot of the bad reviews of this game seem to be people who just pop in to see what the buzz is about. Most of these complains are, to be honest, noob complaints, and i warrant that these arne't really good players to begin with. For people complaining about leveling and the long time it takes, especially one reviewer who said that it took them a year to get to lvl 28, they must've only played a week or two out of that year. Even if you were to kill the monster that gives the least amount of experience, you would at least get to lvl 40 like that. This game is more than your standard grind game, where there are always new places to explore to find monsters that gives much better exp to your level. Staying in one place to level for 28 levels is incomprehensible and inadvisable. Another point i want to make is to the "healing" that takes part in the game. I have to admit that standing around for 3x some min is really boring before going back to fight, but might i remind everyone that there are potions available to consumption. There are npc stores that are tailored exactly to sell those potions which could refill your entire hp in a mere second, so the problem of needing to take a book out to read is moot. I have heard a lot of disgruntled attitudes toward the social nature of the game, but i have to say that in my experience is that helpful friendly people far outnumber the jerks in the game. I have made many good friends during the time i have played, and have found the most repetitive and boring tasks such as constantly grinding to be fun as there is always company in the form of buddies or guildies. To wrap this up, this game to me is more than leveling and getting to the next job advancement, but is more of a social game, say facebook with actually interesting things to do. Friends will always make everything much more enjoyable, and the way maplestory has been made, it really facilatates these interactions and bonds. I would definitely like to see more accurate reviews of this game that aren't written by people who just dipped their toes in this wonderful world. To begin, I'd like to remind everyone that this is a free RPG and therefore can't be expected to be as good as, for example, World of WarCraft or EverQuest II. However, some parts of this game fail to measure up even to the standards of a good free RPG while others far exceed those standards. I'll start with a positive: the music. The varied BGM in this game is excellent, and MapleStory is one of the few games for which I would kill to get the (unavailable) soundtrack. Many tracks will have you tapping your foot or maybe even dancing to the beat. The community in the game is so-so; there are a few relatively nice players but their presence is overshadowed by all of the jerks. Wizet has made an attempt to encourage interaction by creating party quests and guilds (I myself am a guild leader), however it's not nearly enough to make a dent in the less-than-savory types in the community. The gameplay itself is somewhat simplistic; a character has a relatively limited arsenal of skills added on top of a normal attack. This does not stop MapleStory from being addicting, however. Even though I recognize how below average the game is, I still play it on a regular basis. Leveling up is not fun. My main character, a lightning mage with IGN of blah271, is still only level 40 after more than a year. The experience curve isn't horrible, but it could be much better. Questing is similarly monotonous: there are only two types of quests as far as I can tell other than party quests. There are delivery quests and collection quests, neither of which are really exciting. The graphics are truly not up to par; characters have a limited number of possible appearances (these appearances are extended if you buy different ones using money) while the game itself is in glorious 2-D! What fun! However, the interface for the game itself is excellent and easy to learn. Server availability is not an issue; there are 6 or 7 servers on the global version of the game. (I personally use Bera, but as one of the first 3 servers it is becoming somewhat crowded) The most recent servers have hardly anyone on them. All in all, this game could eventually be good, but it needs a lot more work first. Maplestory has no PvP. One bad point and a major one too. I mean, what's the point of playing an MMORPG if you can't hack at someone else? I'd suggest playing GunZ - that's a MMOFPS. Well, except it's in third person but that's not the point. Anyway, back to MapleStory. Four main classes. Hardly anyone uses archers. I've heard all the buzz about hermits, chief bandits, pages, fighters, spearmen and clerics. BUT WHAT ABOUT THE BOWMEN? In this game, job advancements mean specialising in the field that you have picked. Using ice magic turns your magician into an ice-user. Similarly, fire magic, when used very often, tweaks your career path towards being a fire-user. I love thieves, so that's why it's the only one I put down. I mean, LOOK AT THAT! What type of hermit goes around killing little piggies? Or smashing mushrooms? Or goes dungeon hunting? And how on earth are you going to be a chief bandit if everyone else is one too? "Gee, I... erm... don't have one." "Well, too bad then chief." And one thing. If your level exceeds the level required to job change, you lose all your remaining skill points (if any left at all) and do not gain the skill point that every single player gets when he job changes at the right level. What's the meaning of that? 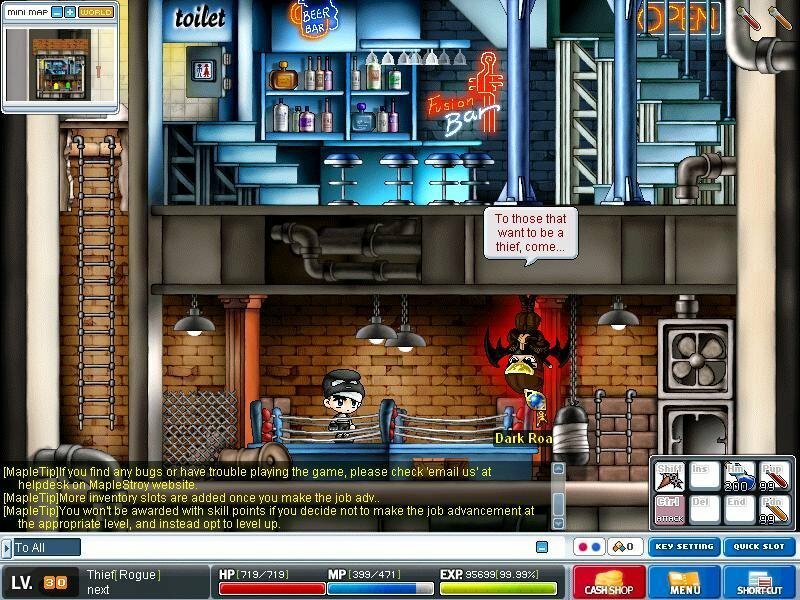 The other games mock MapleStory in terms of sophisticated systems that make their games cool. Hoewever, MapleStory tries to emphasize on the cuteness of its monsters and items, so that's quite a turning point. Innovative, I'd say. Maplestory has the makings of a great game but I think they've got to start naming the characters better and imposing less rules on the jobs. Give players more freedom, I'd say. And PvP. The game, overall, is poor. The good thing with it is that it is free. In the long run it might cost you more money than any many other games. It comes with a cash shop were you can buy items using real cash, this works by using PayPal. By buying cash shop items you can define your characters appearance and purchase various pets. After playing it I also found out that it was a total time waster, you can really loose track of time. It is very addictive. This game requires all your energy when playing. "This program leaves a computer running Windows 2000 or XP exposed to the vulnerability of unprivileged arbitrary read/write access." Even when you delete the game, GameGuard is still present on your computer. The game itself is not secure. There are also problems with hackers who use features such as god mode who spoil the game for everyone. I have played it since its launch date and I have always abided by the game rules. But unfortunately many do not. You can certainly say the other players ruin the game, not all of them! Some of them harass other players. The game needs more policing. If you don’t mind being sworn at by a total stranger or potentially leaving your computer open to hackers, go ahead and play it. I, on the other hand, think I am going to call it a day.